Pros and Cons, Cost, Pricing, Reviews and more. All you need to know about PlanMill series, especially the 40 S.
Want to make your practice more marketable to patients? If the answer is yes, which it almost always is, then you should take a look at the Planmeca PlanMill 40 S, the dental restoration mill that will change your office workflow. The PlanMill 40 S is a full-featured, in-office, chair-side restoration mill that allows for quick milling (without sacrificing quality) so that your patients can get a restoration procedure done in one sitting. Meaning, your patients don’t need to take the extra time off of work, get that babysitter, cancel plans, etc. for an additional appointment unnecessarily. Let that open slot go to another valuable patient. Practical, Innovative, & SMART… Dr. Masoud Samei, a prosthodontist of AUT Says. What does that mean for your practice? Convenience, efficiency and marketability, not to mention cost and time savings in the long run. Planmeca Oy was founded in Helsinki, Finland, by Mr. Heikki Kyöstilä in 1971. Mr Kyöstilä is the President and owner of the company. Planmeca started as a small-scale business, manufacturing dental stools and instrument cabinets. Very early on, however, the company adopted a global sales approach and expanded its product range into patient chairs and dental units – and later on to 2D and 3D X-rays, CAD/CAM products and software solutions. CAD/CAM might seem confusing if you don’t understand what it stands for. CAD stands for ‘computer-aided design’ and CAM stands for ‘computer-aided manufacturing.’ Yes, computers ‘aid’ everything nowadays but we must admit it is beneficial. Just don’t expect Alexa to start milling teeth just yet. A digitalization tool/intraoral scanner for digital 3D impressions that turns geometry into digital information for the computer. Advanced computer software that processes geometric data (teeth) into a 3D digital models. A restoration milling machine like the PlanMill 40 S.
These components are all seamlessly connected and communicate with each other in harmony. CAD/CAM technology is relatively new to dentistry. Although available in the mid-80’s, the technology didn’t advance until recently. Through newly developed standardized production procedures the quality of dental restorations has improved significantly. These technologies increased productivity tremendously and turned dental offices into small dental laboratories with modern computerized production centers. CAD/CAM technology features the ability to machine innovative new materials like the high-performance ceramics and titanium with unrivaled accuracy. However, we must mention a few drawbacks regarding these innovations. First and foremost the initial cost of the equipment can be burdensome to some dental practices. It might be more cost effective to send a restoration to a dental laboratory. This is all dependent on the volume of restorations a dental practice receives. There is a high learning curve that requires an entire practice to learn new methods and procedures. This extends to the way a practice plans appointments. In the end, CAD/CAM technologies have already changed dentistry and will replace the traditional techniques as the tech becomes more advanced. As a side note, patients do notice the innovations or lack thereof in a dental practice and makes their experience poor or excellent. Have you heard of 3D printing? I’m sure you have but did you know you can essentially 3D print a tooth? New in the world of dentistry is generative production methods related to CAD/CAM existing methods. Instead of subtracting material from a block, this method adds material. Generative production methods are unique CAD/CAM methods, which, in contrast to grinding technology, do not work by subtracting, but rather by adding material. In dentistry, there are some areas of application for which this technology is already applied. Some production centers offer ‘laser sintering devices’ that can produce crown and bridge frames from chrome cobalt alloys. Productivity provided by this equipment is very high and make the production of restorations very cost-effective. We will wait and see what the future holds for dental restorations. When is the right time to purchase a chairside mill? There a few required pieces of equipment and software needed to get up and running with CAD/CAM technology. A practice would need an intraoral scanner, which Planmeca offers, along with the chairside mill and software to tie it all together. There are substantial investments required to integrate these technologies fully, a little math and economics will determine if it would be cost-effective for your office. 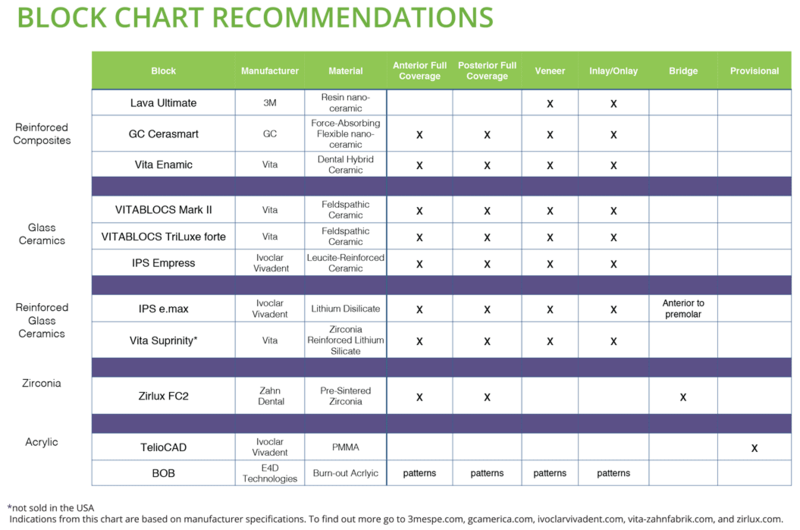 Numerous proposals have been offered to determine the economic viability of integrating chairside CAD/CAM. A surefire strategy is to note the number of restorations your practice produces per month, and the total cost to send those restorations to the lab. Calculating the quantifiable lost in revenue from requiring two separate appointments to do one procedure is also important. Total up everything and determine if the cost of a dental mill is economically viable. Dropping $30,000 can be a fiscal shock or if paid in a lump sum. If done in monthly payments, are the payments cheaper than the dental lab bill? You can find your answer there. Often, the economic calculation will show that it makes sense to purchase a dental mill. On the other hand, if it’s on the border, it should always lean towards being known as the innovative dental practice. If your practice already owns a scanner, then you should be seriously considering a chairside CAD/CAM dental mill. You would need the mill and the compatible software then you’re in business. Get ready to change habits, policies, procedures, and workflows that are an inevitable obstacle when purchasing a dental mill. However, this is usually for the better as it improves the patient’s experience, enhances efficiency, provided new services, and allowed for single-visit restorations are the inherent benefits of owning a dental restoration mill. Making sure the staff is well prepared is essential. Otherwise, the practice risks a rough transition which will reflect poorly on the patient’s experience and your team. It’s imperative that proper training and guidance are in place. It’s only a temporary hurdle. Many current or potential patients are completely unaware of the choices available when it comes to dental technology, rightfully so. When patients find out that a dental restoration does not require a second visit, they are relieved and have an improved experience. A second appointment would mean additional time off of work, finding a babysitter or caretaker, or gag-inducing impressions. Fewer inconveniences means happy patients. The key is making patients aware of the benefits of single-visit restorations through marketing or word of mouth. If you’re concerned about the quality produced by a CAM/CAD system, don’t be, because digitally produced restorations are equal to or better than restorations made using traditional processes. 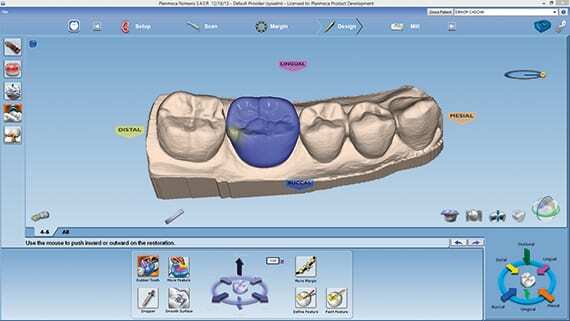 With specialized software, such as Planmeca’s FIT Open CAD/CAM system, clinicians can customize the restoration to perfectly fit the interproximal space. Having the ability to craft a restoration chairside to ensure the contacts are an ideal fit significantly reduces seating time and creates a more efficient process — not to mention a superior restoration. In comparison to chairside CAD/CAM, if a lab restoration doesn’t fit, in many cases it must be returned to be adjusted. Offering a tooth-colored restoration in one single, relatively short visit is the primary goal of the chairside concept. This system is advantages because of the immediate protection of the tooth without a temporary wait for a lab to produce one. The restoration in a same-day visit is accurate and esthetically satisfying if not, another one can be made in the same visit. Scanning is quicker than using traditional impression methods which furthers improves chair-side time. Choosing a chairside mill can be daunting, this is why we put together all this valuable information to make sure innovative dentist know what they’re in for. Here are a few details to consider when researching a chairside dental mill. These are the essential questions you need to ask when comparing different mills. Each model or manufacture can be very different. What materials can I machine? Can I run the machine unattended? How many tools can I use? What can I make beyond copings and crowns? Two major factors will determine the life of your milling machine. The first, and most important is the construction of the machine. Usually, the higher quality of all the parts and the reputability of the company can say a lot about the quality and longevity. The length of the factory warranty and the cost of maintenance should give you a good idea of how confident the manufacturer is of their product. The way you maintain your machine will determine the second factor in determining longevity. Be sure to consistently follow proper maintenance procedures so your costly machine will be well worth the investment. In addition to the quoted price of the dental mill. It’s also important to know the yearly cost of maintaining all the way through year 1-5. Even high-quality dental mills will break down periodically. You will want to be sure you understand the guaranteed “response time” is of the manufacturer. Engineered to provide the smartest and most efficient milling experience. The Planmeca PlanMill® 40 S is built on open technology, allowing for easy integration with CAD software and scanners. Intuitive user interface, monitoring and control capabilities allow predictive diagnostics and service. Add same-day crowns, inlays, onlays and veneers to your menu of services and fabricate your restoration designs quickly and conveniently with the PlanMill 40 S, featuring wireless connectivity and Smart Mill touch-screen operation. fastmill.io In-Office Unit Manufactured in the United States by Glidewell Dental, the fastmill.io™ In-Office Unit is a 4-axis computer-controlled mill that encapsulates technologies initially developed for the laboratory production floor in a form that fits comfortably in the dental practice. The fastmill.io Unit makes it possible to prescribe and deliver same-appointment BruxZir Solid Zirconia restorations — no sintering oven or dental laboratory required. 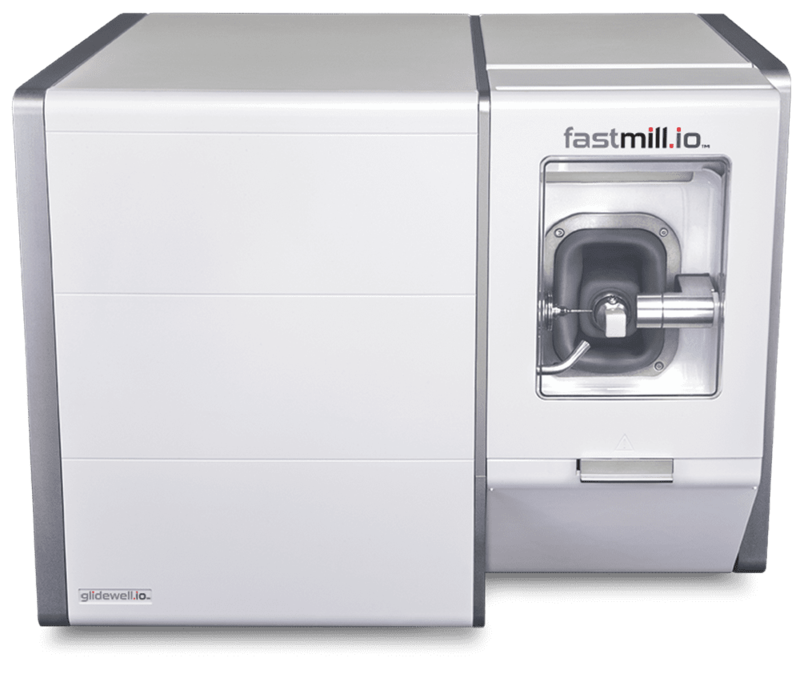 Glidewell Dental is uniquely qualified to offer the fastmill.io Unit, being both the developer of BruxZir Solid Zirconia and a company that’s enhanced countless laboratory workflows with innovative technologies to streamline the production of millions of full-contour restorations. CEREC MC X can produce single-unit restorations, including crowns, inlays, onlays, and veneers. 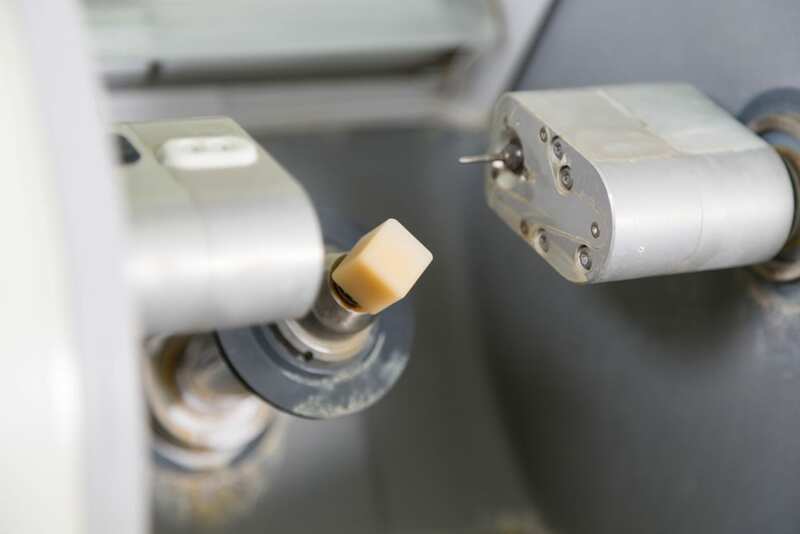 It also has the capability to mill abutments, surgical guides, bridges and other multiple-unit restorations from a vast range of materials, (e.g., glass ceramics, lithium disilicate, and translucent zirconium oxide). Accommodates block sizes up to 40 mm. Dr. Robert Pauley Jr., DMD recounts his experience with implementing a CAD/CAM system. It was clear that it required a lot a patience and a few tester patients. I ascertained that the learning curve was fairly high, and I would need to be patient while implementing the new system into my office. I made sure that I really took time with the first few patients, and booked a half-day so I wouldn’t feel pressured as I was performing the procedure and using the equipment. Eventually, the practice does get into the swing of things and makes the most out of running a CAD/CAM system. Eventually is around four months in this case. After four months of making CAD/CAM crowns, my patients are typically in the chair about three hours. I am chairside approximately the first 45 minutes, which includes prep, scanning, and designing. Then I’m free to see other patients while the restoration is being milled. Planmeca offers the three required pieces of equipment and software. One for scanning, software, and the mill. Our open CAD software suite designed especially for dentists is the perfect tool for sophisticated 3D design and planning at the dental clinic. The software is easy and fast to use and is ideal for designing prosthetic works from a single crown to bridges. Explore Planmeca PlanScan® – the first dental unit integrated intraoral scanner for digital 3D impressions. This high-performance intraoral scanning solution can also be connected to your laptop. How long will it take for the equipment to pay for itself? Is the equipment easy to learn? Can it be implemented into my practice immediately or are additional investments in training and resources required? Will my staff be willing and able to operate the equipment or will I need to use my time to operate it? time person to manage its operation? each day using the equipment and how much is that ultimately going to cost in chair-side production? Will I get a chance to use the equipment before I buy it? Is my staff enthusiastic for the new equipment to be added to the office? Will the equipment enhance the type of dentistry I want to do or does it dictate the type of dentistry I have to do? it up, would my dental practice’s productivity be negatively impacted, positively impacted, or would there be no measurable impact? Amsadmin. “Selecting a Dental Milling Machine.” ACDLA. February 18, 2015. 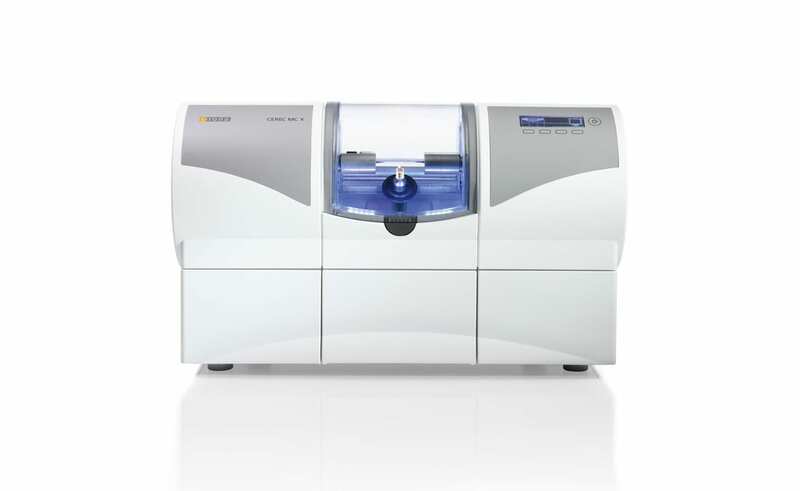 Accessed May 18, 2018. http://acdla.net/selecting-a-dental-milling-machine/. Ayu Dental. “Planmeca PlanMill 40 S Milling Unit | Fast and Accurate Milling Unit.” Ayu Dental Is a Global Supplier of High-Quality Dental Equipment. Accessed May 18, 2018. https://www.ayudental.com/product/planmill-40-s/. Baroudi, Kusai, and Shukran Nasser Ibraheem. Advances in Pediatrics. April 2015. Accessed May 18, 2018. https://www.ncbi.nlm.nih.gov/pmc/articles/PMC4409808/. Beuer, F., J. Schweiger, and D. Edelhoff. “Digital Dentistry: An Overview of Recent Developments for CAD/CAM Generated Restorations.” Nature News. May 10, 2008. Accessed May 18, 2018. https://www.nature.com/articles/sj.bdj.2008.350. “CAD/CAM Dentistry.” Wikipedia. May 15, 2018. Accessed May 18, 2018. https://en.wikipedia.org/wiki/CAD/CAM_dentistry. CEREC. “CEREC MC X | Patterson Dental.” CEREC. Accessed May 17, 2018. https://www.pattersondental.com/equipment-technology/product/345684/cerec-mc-x. CEREC. “Produce with CEREC | Dentsply Sirona.” Scan with CEREC. Accessed May 18, 2018. https://www.dentsplysirona.com/en/products/cad-cam/dental-practice/produce-with-cerec.html. Dental Compare. “PlanMill 40 S Milling Machine.” Dental Compare. February 21, 2018. Accessed May 18, 2018. https://www.dentalcompare.com/25059-Chairside-Dental-Milling-Machine/4931487-PlanMill-40-S-Milling-Machine/. Dental Economics. “Implementing an In-office CAD/CAM Restoration System.” Dental Economics. May 20, 2014. Accessed May 18, 2018. https://www.dentaleconomics.com/articles/print/volume-104/issue-5/features/implementing-an-in-office-cad-cam-restoration-system.html. Dental Product Shopper. “New Product: PlanMill 40 S.” Dental Product Shopper. Accessed May 18, 2018. http://www.dentalproductshopper.com/article/new-product-planmill-40-s.
Elsenpeter, Robert. “The Truth about Chairside Dentistry.” Staging.dentalproductsreport.advanstar.com. April 17, 2017. Accessed May 18, 2018. http://www.dentalproductsreport.com/lab/article/truth-about-chairside-dentistry?page=0%2C3. Fastmill. “Fastmill.io™ In-Office Unit.” Glidewellio. Accessed May 18, 2018. http://glidewell.io/fastmillio-in-office-unit/. Kaye, Gary. “When Is the Right Time to Start Providing Chairside CAD/CAM?” Dental Economics. June 01, 2017. Accessed May 18, 2018. https://www.dentaleconomics.com/articles/print/volume-107/issue-6/science-tech/when-is-the-right-time-to-start-providing-chairside-cad-cam.html. Planmeca. 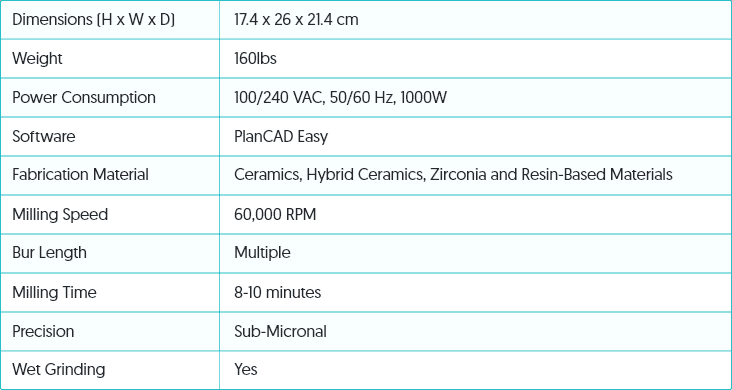 “CAD/CAM for Dental Clinics | Planmeca FIT.” Planmeca PlanMill 40 | Planmeca USA. Accessed May 18, 2018. https://www.planmeca.com/CADCAM/CADCAM-for-dental-clinics/. Planmeca. 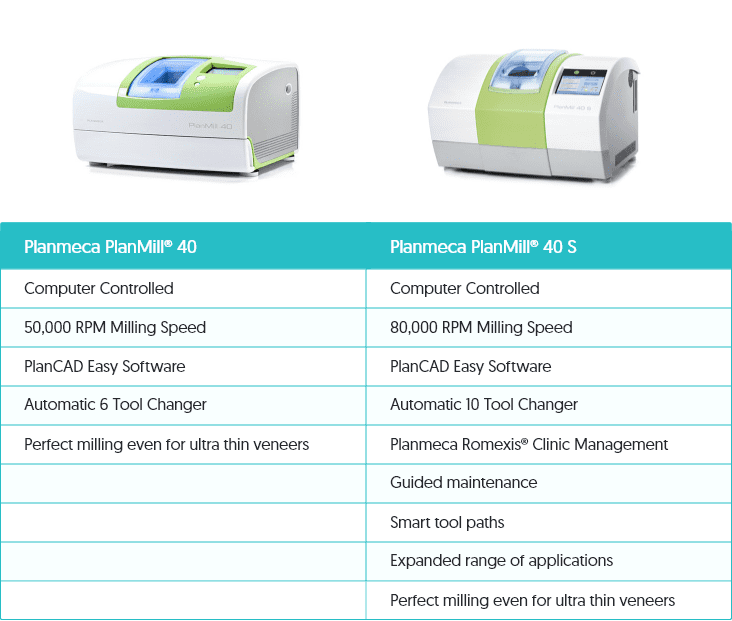 “FAQ: Planmeca Emerald Intraoral Scanner and PlanMill 40 S.” Decisions in Dentistry. October 02, 2017. 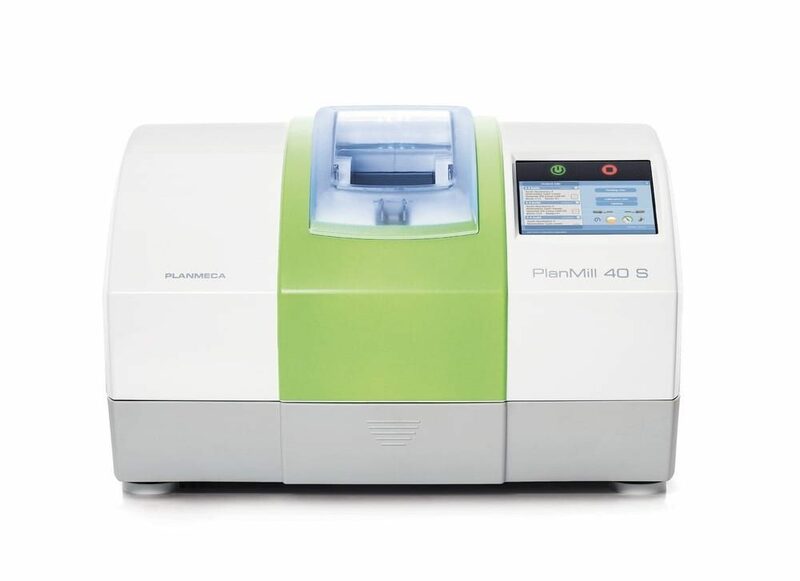 Accessed May 18, 2018. http://decisionsindentistry.com/article/faq-planmeca-emerald-intraoral-scanner-planmill-40-s/. Planmeca. “Planmeca PlanMill 40.” Planmeca. Accessed May 18, 2018. http://www.planmecalatam.com/cadcam/chairside/planmeca-planmill-40/. Planmeca. “Planmeca PlanMill 40 S Dental Milling Unit.” Planmeca USA. Accessed May 18, 2018. https://www.planmeca.com/CADCAM/CADCAM-for-dental-clinics/planmeca-planmill-40/. Planmeca. “Planmeca PlanMill 40 S.” Planmeca USA. Accessed May 18, 2018. https://www.planmeca.com/na/CADCAM/cadcam-for-chairside/planmill40/. Planmeca. “PlanMill 40 S.” Planmeca PlanMill 40 S | Planmeca USA. Accessed May 18, 2018. https://www.planmeca.com/na/CADCAM/cadcam-for-chairside/planmill40/. “The Real Cost of In-Office Milling.” Http://adentmag.com. Accessed May 18, 2018. http://adentmag.com/the-real-cost-of-in-office-milling/. Read reviews, learn creative ways to save money and choose the best options available to you.